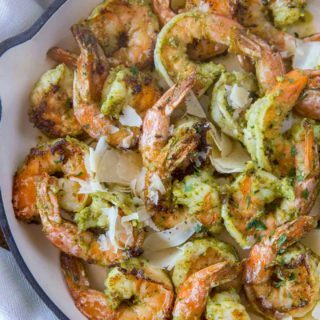 Pesto Shrimp made with homemade pesto is the easiest and most flavorful shrimp with an herby, Parmesan flavor and it looks so impressive! Add the shrimp to the pesto and let sit for 15 minutes. Heat a large skillet over medium high heat and add the shrimp (scrape off the pesto) to the pan, cooking on each side for 1-2 minutes and garnish with Parmesan cheese before serving.